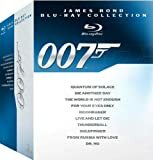 Posted By: Movies Published in Former Blockbuster Tags: Bluray, Bond, Collection, james, ThreePack, Vol. This exclusive Bond giftset contains 10 of 007’s finest missions, including his latest, Quantum of Solace! Pro Tennis Lessons Complete 10 DVD Boxed Set, Starring Renowned USPTA Pro James Jensen: Includes over 12 Hours of Professional Tennis Instruction for all level Players!